The qCell T utilizes a unique sensor design and a precise temperature control function to deliver a stable reading of the fundamental frequency and damping. The instrument and it's software are easy to use and intuitive. A user with limited background knowledge can be trained to use the system with little effort. 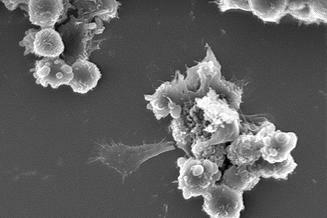 I got the opportunity to use the qCell T for layer-by-layer buildup of polyelectrolytes. The advantages of the apparatus are the following: - the stability of the baseline is very good and the software indicates when you can begin the experiment - good reproductibility - the possibility to put the injected solution in thermically controlled holder at the same temperature as the experiment - the software writes in the data file when you inject the solution. We have successfully used a flow cell set-up of the qCell T to monitor changes in EGF-induced cellular response of a monolayer of A431 cells. As an experienced QCM user, I recommend this instrument because it is easy to use and its performance is highly reproducible and reliable. Confronting the present QCM instrument availability for heamostasis for carrying out the basic and applied research in challenging area, I only see one option in the market that is qCellT. Basic reason is the rapid stability of baseline and thermostat in real time measurements that is required for this purpose. 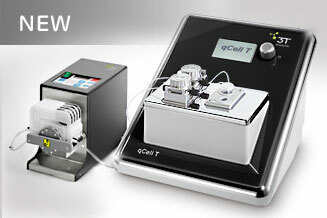 The qCell T meets our requirements concerning easy sample handling and data aquisition and a comprehensive data documentation. 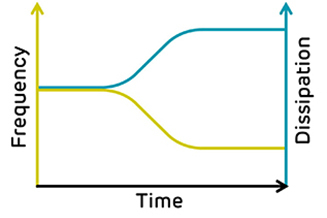 The longterm stability of the detected frequency and dissipation signals, as observed in recent pilot studies, is of outmost importance for the detection of biological interactions with biomaterial surfaces, such as bacterial adhesion or biofilm formation.